Comfy days and cozy nights all begin with a fabulous sweater. A wonderful topper for leggings and jeans, this asymmetric pullover features a split hem for a swingy, comfortable silhouette. All rendered in a soft knit that's totally snugglelicious! Diane, I love, yes Adore this top, From our home to You and Yours We Send You Healing Love Warmth and Enchanting Blessed Holiday. warm wishes, You Look Beautiful. Thank You Diane, my favorite. Happy Rocking New Year, my Friend. Hurry back XoXo from NJ. Love You. Love this top! Got it in the pink and ordered another in wine. Nice elongating effect ( Im 58 but you can never be too svelt ). Looks great with a coordinating scarf. I must have about 50 DG2 jeans and many of her tops...this is one of her best tops. Can tie it on the side, put a fun brooch (especially with coordinating earrings ! ) where it splits or even add a wide ribbon when you tie the side pieces to match jeans or an accessory item. Love this top! You can size down with this top. Love this sweater I tied in bow however looks great with out now, I bought black and want to go back for Teal . I'm a petite but this too works. Bought the pink and it's so flattering. I got the teal like color.....the one showing....and I love it. Can wear it two or three different ways with that tie. I bought the small. Bust is 36. Hope this helps. 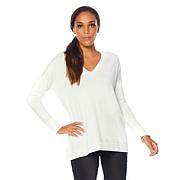 This is a more casual top.Would like more in different colors, but unable to do that. The comforting feel of chenille and the loose, boyfriend style will make this cardigan a fast favorite. Super plush, soft and stretchy, it's like being wrapped in love. The open style looks great over anything, from a silky blouse and pencil skirt to a t-shirt and jeans. Exude sophistication in a captivating sweater, shimmering with metallic threads. The cutout neckline is a head-turner all right, and the slit sleeves add a notable difference to the silhouette. With a close fit, it flatters your figure in the best possible way. Pure class.